AUMsilence	provides	potent	mRNA	knockdown	by	using	FANA	technology	which	is	a	third	generation	chemical	modification	platform. FANA	technology	allows	simple	and	efficient	delivery	into	difficult-to-transfect	cells	and	animals	without	the	need	of	transfection	reagents	or	formulations. FANA	Antisense	Oligonucleotides	(FANA	ASOs)	are	uniquely	modified	with	2'-deoxy-2'-fluoro-arabinoguanosine	(FANA)	that	enhances	the	intracellular	stability	of	the	oligos,	as	well	as	their	binding	to	the	target	mRNA. 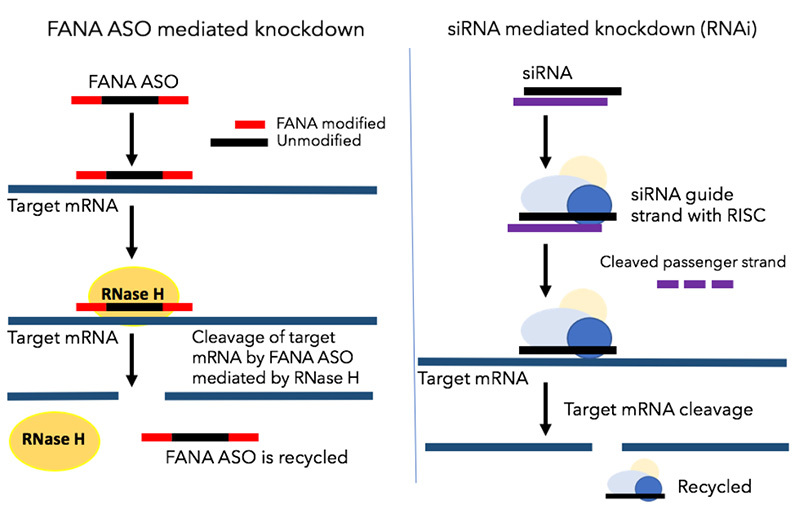 The	FANA	modifications	also	allow	for	the	oligos	to	be	self-delivered	into	cells	without	any	transfection	reagents,	as	well	as	in	animals,	without	the	need	of	special	delivery	formulations. Knockdown	of	Bcl-2	by	FANAs	in	518A2	melanoma	cells	and	PC3	cells. Densitometry	analysis	of	western	blot	in	518A2	melanoma	cells	and	PC3	cells	after	FANA	treatment	with	varying	concentrations	showing	up	to	90%	knockdown	(Figure	2). Adapted from Souleimanian	et	al. 2012. Knockdown	of	androgen	receptor	(AR)	by	FANAs	in	LNCaP	prostate	cancer	cells,	LAPC4	ad	VCaP	cells. Densitometry	analysis	of	western	blot	in	in	LNCaP	prostate	cancer	cells,	LAPC4	ad	VCaP	cells	after	FANA	treatment	with	varying	concentrations	showing	up	to	90%	knockdown	(Figure	3). Adapted from Souleimanian	et	al. 2012.